A terrarium is similar to an aquarium except that it isn't full of water and fish. It's a tank made of glass or plastic with a wire mesh lid. The mesh allows air to come in and keeps the reptile from escaping. Reptiles are cold-blooded, unable to make their own body heat, which is why it is hard for them to move around if the temperature isn't right in their environment. Reptiles lay eggs to hatch their babies. Unlike human babies, which are dependent at birth, reptile babies are born ready to care for themselves. A successful terrarium is set up with the proper heat source for temperature perfection. A thermostat will ensure the correct temperature at all times. Reptiles need a basking lamp to sunbathe and a light tube for ultraviolet rays. It sounds expensive and complicated to a beginner, and it very well may be depending on what your idea of expensive is. But once your terrarium is set up, the biggest hurdle is being able to afford the proper food and bedding. The expense of bedding is reduced if you buy two pieces of indoor/outdoor carpeting to allow one to be cleaned while you use the other for your pet. There are several ways to set up your terrarium, depending on the needs of your reptile. The desert terrarium will need coverage over the inside bottom floor. Most people choose sand or gravel for the desert appeal. Plants will add a hiding place for your reptile and helps increase the natural look and feel of their environment. You must provide water even in a desert setting for three reasons---drinking, bathing, and moisture. Even in the desert a certain amount of water is necessary. It should be kept clean and accessible at all times for your pet's comfort and to ward off disease from unclean water. 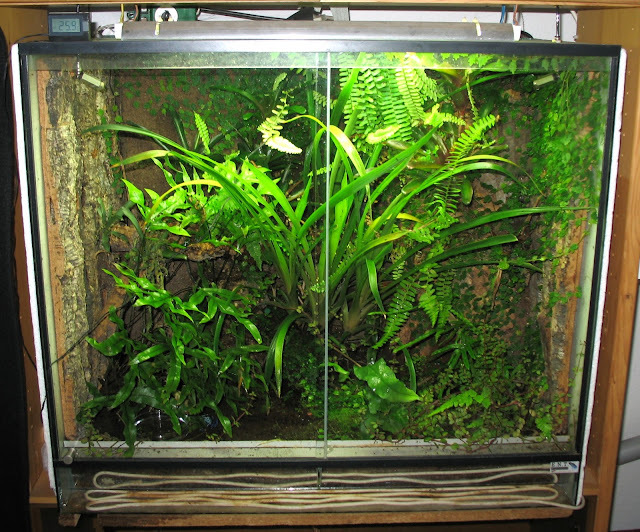 Sometimes a lizard or snake reptile will prefer a tropical forest terrarium setting. You'll have to make sure you regulate the day and night temperatures. Investing in some sort of timer will make this less of a chore and safer for your pet. The tropical forest is kept damp at all times. Provide a layer of wood chips and maybe some moss to hold the moisture. Keep some sort of trees to allow your reptiles to climb among the branches. Turtles and some snakes require a habitat that is part land and part water. You must purchase a heater designed to control the water temperature. Adding rocks allows the reptile access out of the water when needed. The rocks should be free of sharp edges to avoid injury to the reptile as it navigates through its home. Place a fluorescent light over the dry areas to allow sunbathing. The last habitat choice is called a savanna. You can consider it a medium ground between the dry desert setting and the very humid tropical setting. It's also cooler than either and stays only slightly damp. Shady areas should be included for the pet's comfort. Plastic plants discourage the reptile from eating the scenery. Coarse gravel is allowed in the savanna setting. Maybe they're not exactly cuddly, but snake makes interesting pets. Regardless of the type of snake, from nice little corn snakes up to monster Burmese pythons, there are some principles that apply to setting up a cage or enclosure for a pet snake. One of the most important aspects is to make sure the enclosure is absolutely escape-proof. Snakes are known to have Houdini tendencies when it comes to staying confined. 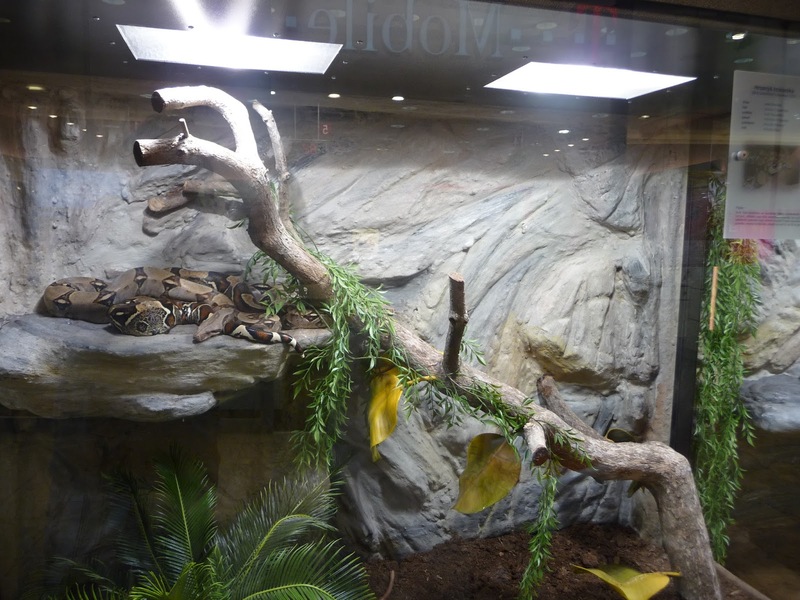 Aquariums make good enclosures for snakes, but the lids have to fit tightly and be clipped on. Some owners make belts to attach to the enclosure for more security. Any doors or openings in the cage need to fit tightly or the snake will push against it trying to get out. Remember, most of them are pretty slim, so they don't need that big of an opening to slip out. The size of the enclosure should reflect the size of the snake. Many babies are insecure in a large cage and even have trouble finding their food. It's usually advisable to put young snakes in smaller enclosures. To choose a size of cage for an adult snake, first, measure the length of the snake. Get an enclosure with a perimeter that measures twice the length of the snake. For instance, a three-foot long snake would do OK in an enclosure 12 by 24 inches. The exception to the above rule is arboreal, or tree-dwelling, snakes. These need a taller enclosure with lots of branches for climbing. A snake enclosure needs a material to cover the bottom, called a substrate. Newspaper can line the bottom of the enclosure and makes a cheap surface that absorbs moisture and is easy to change when soiled. There are also special types of carpeting available at the pet store to use as a substrate. If you have two that fit, you can use one while washing the other. Temperature is very important in a snake enclosure. Snakes are cold-blooded animals and have to keep warm from outside sources. Ideally, a pet snake's cage will provide several choices in temperature so the animal can regulate its body heat. This is done by heating one end of the enclosure only. Heating methods include heating pads under half of the enclosure or heat lamps. If using a light, it will need to be off during the night hours. Thermometers should be used to monitor the inside temperature. Requirements vary from one species to another. A pet store product called a "hot rock" is widely discouraged because it has a tendency to burn pet snakes. Using a heat lamp or infrared heating panel is a far better way to provide the snake with heat. Some snakes have specific humidity requirements, too. A hygrometer can be used to monitor humidity. Misting the enclosure from time to time can help keep it more humid when necessary. The snake will need a water bowl. Ideally, it should not tip easily. For most varieties of snake, it should be large enough to take a soak once in awhile. Keeping it only about a third full helps avoid soaking the substrate. Pottery and wide based pet food dishes work well for water bowls. A final necessity in the enclosure is a place for the snake to hide. This can be as simple as a plastic dish with a hole cut in the side. Having two, one on each end of the enclosure, gives the snake a choice. Setting up a nice enclosure takes a little time and money, but will ensure your snake has comfort and security.